HCM City (VNA) – A trade promotion fair for cooperatives nationwide kicked off in Ho Chi Minh City on April 17. The four-day event is jointly held by the Vietnam Cooperative Alliance (VCA) and the Institute of Vietnam Organic Agricultural Economics. It hosts over 350 booths of domestic cooperatives and firms and foreign countries such as Japan, Thailand, Malaysia and the Philippines, among others. On display are products in agro-forestry-fishery and industrial sectors, including farming machines and plant protection products. 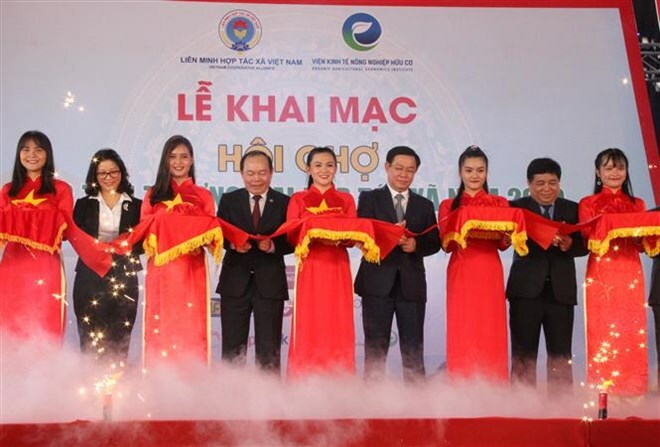 Speaking at the opening ceremony, VCA President Nguyen Ngoc Bao said the Party and Government of Vietnam have issued various incentives to support economic development of cooperatives nationwide. Various programmes to introduce products of cooperatives have been held across the country and overseas, he added. Vietnam is currently home to more than 22,400 cooperatives totalling 7 million members. Of this, 13,000 cooperatives are in agriculture.